Be cool AND stay cool this summer! The single most important appliance in your home in Dubai and the UAE is not your refrigerator, nor your microwave, nor your state-of-the-art juice blender (side advice – eat the whole fruit, it’s better for you): it’s your air conditioner. For any mere mortal to survive in the scorching desert heat in Dubai and the UAE, you need your AC to keep you alive and comfortable. Hey – blame it on evolution. Filter –a porous material that reduces the amount of dust released into the air. Filters are rectangular or square and can be easily removed from the indoor unit. Duct work – located in the ceiling, these are the round tubes are responsible for the distribution of cool or heated air to the rooms. Thermostat – a small box mounted near the indoor unit that controls your AC unit. With it, you can change the temperature and fan speed, amongst other things. Register – the registers, or grills, are the inserts in the ceiling or floor that deliver air into your home. Registers can deliver and return re-heated air into a room. Now that you know the language, just know that proactive maintenance is the key to a properly working air conditioning unit. Regular maintenance will also help in lowering your monthly DEWA bills and result in an AC that works much, much better. Some AC models come with disposable filters, while others have filters that can be cleaned with water. Regardless of the filter type, cleaning this part of your unit on a regular basis should be your number one priority. With dirty and dusty filters, your AC system will have to work harder to deliver comfortable air to the home. It’s basically the equivalent of covering your face with a plastic bag leaving one tiny hole to breathe from. Yes – not comfortable at all. After all, we all know that cleanliness is next to godliness. So why not take this thought and apply it to your AC? The outdoor unit, or condenser, should always be kept clean and free of any blockages. Plant growth, debris, or grass clippings can clog and damage the condenser, causing it to run less efficiently. Using a clean cloth or brush, gently clean the coil from the fins. Make sure not to use a lot of force or you may bend the fins. Keeping the outdoor unit clean from debris will reduce resistance and boost your A/C system’s efficiency. Do not forget to turn off the thermostat before attempting to clean the unit. Just like your own internal ductwork, blocked AC ductwork can be damaging. Because ductwork is hidden within ceilings and walls, only a professional should take care of this (you wouldn’t clean out your own ductwork, would you?). You can keep parts of your ductwork clean and dry by removing registers and inspecting/wiping the visible parts of the ducts. You can also inspect these parts of the ducts for wear or water damage. Due to condensation, the air ducts can accumulate moisture. This can damage your system and can lead to the growth of mold and fungus. If there is water damage to your AC unit, address the problem immediately by calling a professional. Do not try to repair the system on your own, since there could be many different issues resulting in the malfunction. Inspect the fan belts regularly and adjust or replace them if needed. These parts can be found at your local hardware or home improvement store. However, be sure that you purchase the correct replacement part for your particular system. These components ensure that your A/C system is running at maximum efficiency, so they play a key role in lowering your energy bills. You should hire a professional to inspect and “tune” your air-conditioning unit once in a year, especially right before the summer. Besides having the right tools and expertise, a licensed contractor can unclog, fix or upgrade your system, keeping it running efficiently, and address issues before they become problems. The cost of a seasonal tune-up is a minimal investment that can keep prolong the life of your system where performed regularly. By now you would have realized that the only way to stay cool (literally) in Dubai and the UAE is to make sure that your AC is in tip-top shape. 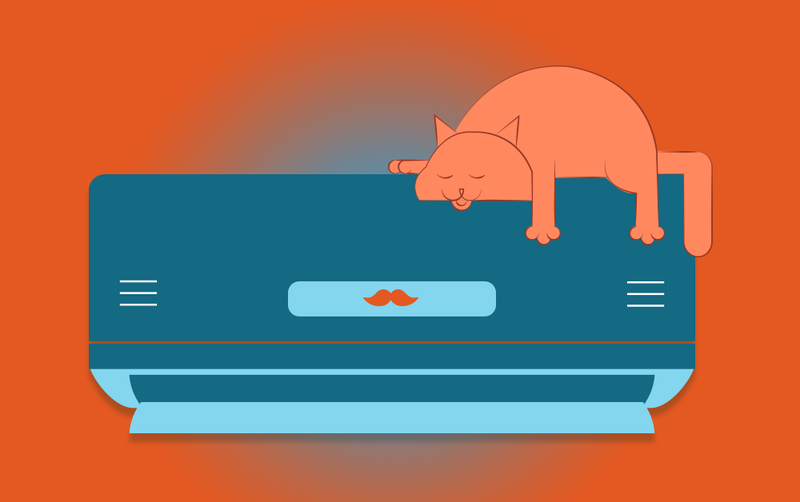 Need a little more incentive to get your AC checked out? Use the voucher code STAYCOOL50 and post a job for AC maintenance on Mr Usta today!